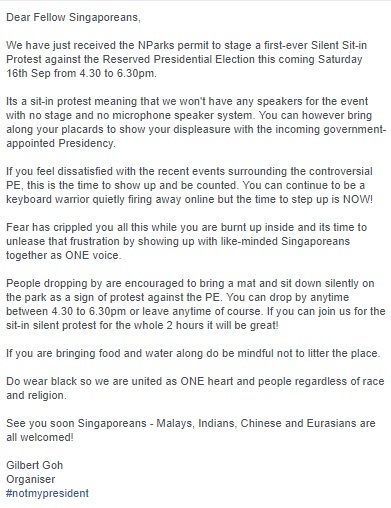 Following his unsuccessful attempt to hold a protest event against this year’s Reserved Presidential Elections last month, activist Gilbert Goh is now calling for a silent sit-in protest at Hong Lim Park this Saturday (Sept 16). This comes after the announcement that only one presidential candidate, Madam Halimah Yacob, was issued the Certificate of Eligibility. She will be sworn in as the eighth President of Singapore tomorrow (Sept 14) at 6pm at the Istana. The event will not have any speakers, and people are encouraged to simply sit down in the park as a sign of a protest against the PE. Participants were also told to wear black on Saturday. In fact, #NotMyPresident black tee shirts will be sold on Saturday so that participants can wear them during the sit-in protest. 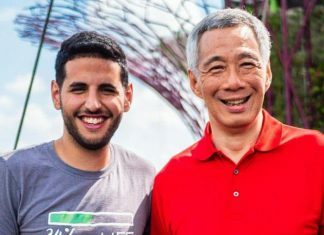 The hashtag had trended after the walkover was announced, when Singaporeans took it to social media to express their anger about losing their voting rights. At the time of writing, 108 people had confirmed their attendance, while 537 people had indicted their interest in the protest. Our first-ever lady Muslim President Halimah will be inaugurated today and amid the pompous fanfare, Singaporeans feel a sense of betrayal that they have lost the chance to vote in the next head of state. The loss of the democratic right to vote angers people personally even though they know that Halimah will probably win comfortably against the other two candidates. Voters now sense the probing encroachment of individual rights by the government and they react adversely online through the use of powerful social media. Its an election that is filled with all kinds of controversy chief of which is the true ethnic identity of the President-elect – is she a Indian or Malay? Is she being appointed or is the whole election fiasco merely a deceitful sham? Will all future Presidents be closely aligned to the government and if so why bother to have an election? These are all important questions which bugged ordinary Singaporeans of which there are no ready answers from the government yet. Things degenerated further before the epic climax and we now face a walk-over President who will have a lot to prove that she is no lame-duck like those before her. Naturally, the poor President faces the furious leash of the whole systemic failure and it will take a while for things to cool off. Yet many feel that the fault lies squarely on the Singaporean voters who have given a strong mandate to the government in 2015 to do what they like. With a 70%-voting population behind them, they ploughed on confidently knowing that the people are truly behind them now after a disastrous showing in 2011. This also means that the government may not always want to consult the people first before acting – thinking that they have the backing of the people from the strong polls result. The saving grace of the whole saga is the unifying factor it has generated – linking many dissatisfied Singaporeans up and we must thank the social media for that. People turn to their Facebook and other social media platform to voice out their frustration and over time the escalating discontentment morphed into an oasis of unity and togetherness. There was an earlier event that we have planned two weeks back but due to the fact that we need to apply for a additional police permit because there is the issue of race involved we have decided to cancel that event altogether. However, we have now organize another event on 16th Sep (Sat) and there won’t be any speeches but participants will gather for a silence sit-in as a sign of protest against the systemic failure of the Reserved PE. The NParks permit application was approved on 12 Sep.
Its also Singapore’s first mass sit-in protest without any prepared speeches and hopefully there will be a good size crowd to show to our government that we are unhappy with how things have gone for the Presidential Election. 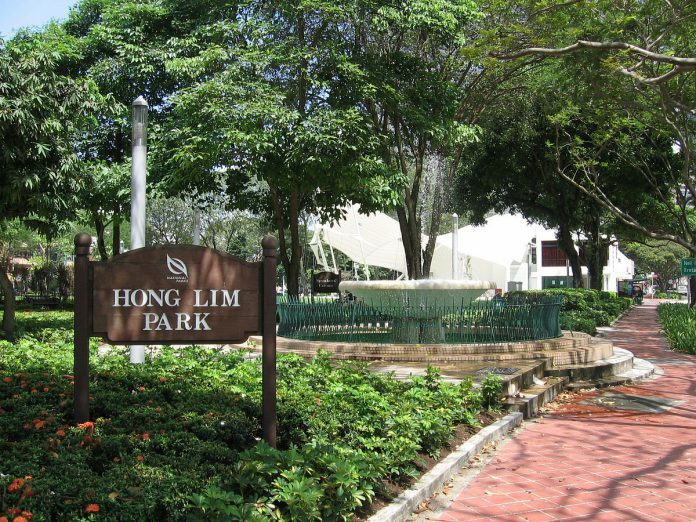 There will also be a short press conference close to 630pm on-site and the organisers will be there to provide any press interview whenever necessary during the event. Do contact me via email at goh_gilbert@yahoo.com if you need further assistance.